The McDaniel College Department of Music will present the McDaniel College Choir’s spring concert, “Spirit: The 150th Anniversary Reunion of the McDaniel College Choir,” Sunday, April 22 at 7:00 p.m. The concert will take place in (Big) Baker Memorial Chapel. 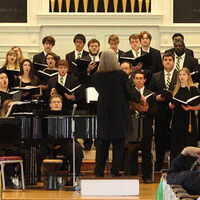 The choir is led by Margaret Boudreaux, Director of Choral Activities; David Kreider serves as accompanist. Guest McDaniel College Choir alumni will be featured as singers and conductors and the College’s Madrigal Singers will be featured on several selections. The choir is composed of McDaniel students Kate Baremore, Lauren Bass, Ethan Brown, Colleen Clark, Ethan Cortes, Joseph Fox, Calea Gelnett, Angelina Gill, Laura Hawk, Elizabeth Hobbs, Erin Karrh, William McCarthy, Waide McComas, Ben Michaels, Julia Reznikov, Harlow Schipper, Jared Schrader, Jackie Sherwin, Laurissa Steinsberger, Miriam Stewart, Arlo Vega, Jen Willard, and Jared Wilmer. McDaniel senior Joseph Fox and Thaddeus Franzén, who has sung with the choir for three semesters while completing his AA at Carroll Community College, will each conduct one selection. This concert features works celebrating the singing "Spirit" of College Choir throughout the history of McDaniel College. Invited alumni will join the choir for Barbara Baker's new arrangement of the song "Spirit," as well as on the opening "Alma Mater" and the choir’s traditional closing "The Lord Bless You and Keep You." Other works will reflect the diversity of repertoire explored by the choir over the years, from the classical tradition of Mozart’s "Laudate Dominum" (from the Solemn Vespers), featuring senior Laurissa Steinberger on the soprano solo, to Stephen Paulus's heartbreakingly beautiful folk song arrangement of "The Road Home," to the King Singers arrangement of "You are the New Day," to Aerosmith's "Dream On," (conducted by student Joseph Fox). Of particular note is “The Small College,” by director Boudreaux, based on words written by Herbert Hoover to the president of then Western Maryland College in the 1930's.